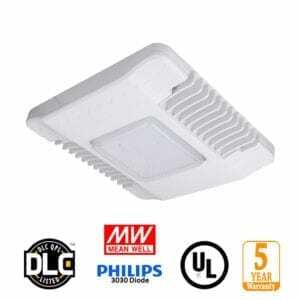 Americas Best canopy light works great for parking lot illumination as they have a wide beam angle for lower ceilings and emit a small amount of light upwards to eliminate a dark overhead ceiling. 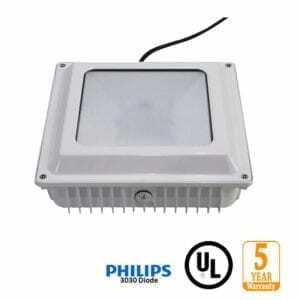 The 45 watt canopy light replaces a 175 watt Metal Halide lamps and our 75 watt canopy light replace 250 watt HID lamps. The canopy light can be mounted direct to any surface or suspended on a rigid pipe fitting. Conduit entry points are on each side of the canopy light and the top.